On the last night of a tour in Tuscany, my well-meaning tour group managed to freak out the inhabitants of the small village of Pienza, simply by bringing the wrong flowers. During a walking tour in Tuscany, I had hosted the group to lunch at my house, and after a week of walking together, we had bonded into a merry group. As a token of thanks for a great vacation, the tour participants decided to give me a gift – a lovely gesture when done right. 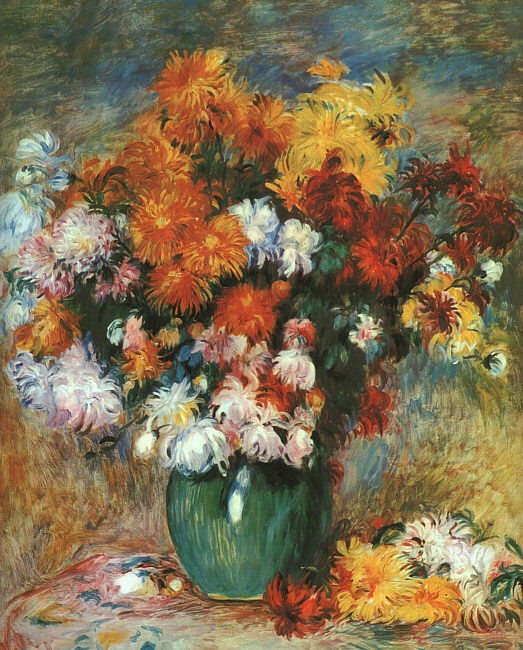 At a florist they saw that there were many potted plants, and so purchased a large pot of chrysanthemums, which they thought would look nice in my garden. They carried the chrysanthemums into the restaurant as a surprise for me. “Che bella pensata” said the owner Roberto a longtime friend – "What a nice thought" he joked sarcastically, "che diavolo hai fatto?" – what the hell did you do? Then Roberto’s wife walked in and gasped, “Chi è morto?!" – Who died?! Meanwhile I graciously accepted the plant, and then Roberto furtively ushered me out the door with it. It was briefly parked by the front door of the restaurant , but then several restaurant patrons, who knew Roberto, came in with worried looks. “Che cos’è successo" – what happened – they asked in whispered tones. Roberto signalled me to get that plant out of the vicinity. As I went out to pick up the pot of chrysanthemums, there were several people outside the restaurant, hesitating about whether to come in or not. Though I was struggling with the plant, no one offered to help, though a couple did bless themselves. "There was a misunderstanding", I said in attempt to explain, but they just stared at me in reverent silence. I dragged the pot of chrysanthemums down the street and around the corner, leaving it by an abandoned car. At the end of October, florist shops in Italy are filled with chrysanthemums, the flower that is typically associated with death in Italy. During the period leading up to November 2, Il Giorno dei Morti, or Day of the Dead, Italians flock to the cemeteries to commemorate their dead, very often leaving chrysanthemums at a gravesite. So no matter how lovely a pot of chrysanthemums may be, unless you want to give the gift of death, refrain from giving them as a gift in Italy. Foreigners are not the only ones to make mistakes in etiquette – read about an Italian blunder. I recall when I went to purchase flowers for my fathers grave in Sicily , the flower sellers had wagons parked in front of the cemetery gates for you to purchase, I had no idea certain flowers bespoke of death to them. My Italian girlfriend just passed her orals exam and to celebrate I surprised her with flowers….mums! That was the initial mistake then…the horror of her mother when she saw them on Skype! Jeff- That is hysterical! Guess your girlfriend was surprised. Love the horror of la mamma…via skype.